By default, the Temporary Internet Files folder in Internet Explorer is located in the C:\Documents and Settings\[username]\Local Settings folder in Windows XP. As the name would suggest, the IE browser uses this folder to store temporary internet files. If for some reason the location of that folder has moved — like due to a malware issue or a change you made yourself — some very specific issues and error messages can occur, the ieframe.dll DLL error being a common example. Moving this folder back to its default location is easy through Internet Explorer's own settings, so you don't have to remove and reinstall Internet Explorer or reset all of its options. If you don't remember changing this folder location yourself, and especially if your computer is behaving abnormally, be sure to run a malware scan to remove any potentially unwanted program that could have changed the folder location without you knowing. You can move the Internet Explorer Temporary Internet Files folder to its default location in Windows XP through the Internet Options window. Configure Windows XP to show hidden files and folders. Some steps below require that hidden folders are viewable so this prerequisite is a must-do. Type inetcpl.cpl in the Open: text box. Click the first Settings button. This button is in the Browsing history section. This option is near the bottom of the Temporary Internet Files section of the Temporary Internet Files and History Settings window. Click + next to the C: drive to open that folder. Click + next to Documents and Settings and then click + again next to the folder corresponding to your username. For example, I would expand the folder Tim since that's my username. Click Local Settings under your username's folder. There's no need to click on the + next to the Local Settings folder. Just highlight the actual Local Settings folder. Don't see the Local Settings folder? Windows XP may not be configured to show hidden files and folders. See Step 1 above for more information. If you show hidden files and folders at this step, you have to jump back to Step 6 to refresh the folders. Click OK in the Browse for Folder window. 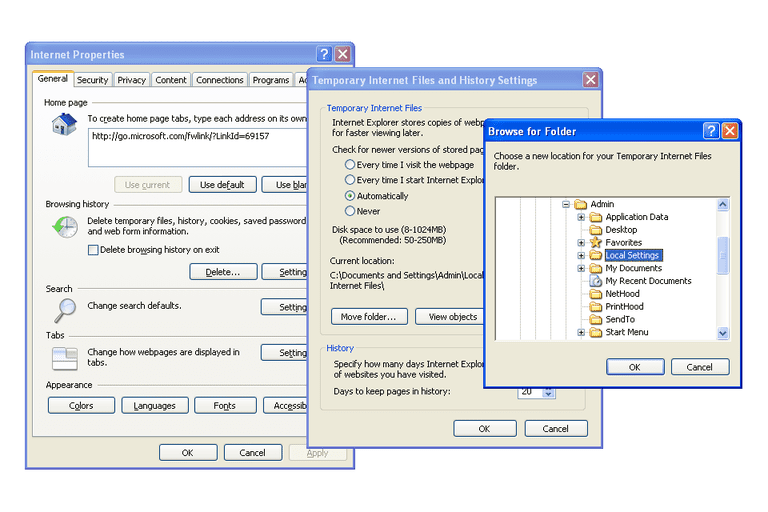 Click OK in the Temporary Internet Files and History Settings window. Click Yes if prompted to log off to finish moving temporary internet files. Your computer will immediately log off, so be sure to save and close any files you might be working in before clicking Yes. Log back onto Windows XP and test to see if returning the Temporary Internet Files folder to its default location has solved your problem. Configure Windows XP to hide hidden files and folders. These steps demonstrate how to hide hidden files from normal view, undoing the steps you took in Step 1. Another way to make this change is to use the Windows Registry. It's much easier to use Internet Explorer as described above, but if you can't for some reason, try this method. Temporary Internet Files Location Information (Windows Registry). Double-click Cache on the right side of Registry Editor. Still Can't Change the Folder? If after making the changes above, the location of the Temporary Internet Files folder still won't change, even after a reboot, there are a couple of things to look at that could be the cause. For starters, check that your antivirus program is running and actively scanning to catch malware. It's possible that a virus on your computer is to blame for these settings not changing when you tell them to. With that being said, some antivirus programs are over-protective of the registry and will prevent changes, so even if you're making the change yourself, the antivirus program might be blocking your attempts. If you're sure you're not currently suffering from malware, temporarily disable your antivirus program and try again. If the folder can be altered while your antivirus program is off, reboot and check again just to be sure. If the new folder location stays, turn your security software back on. The change you made should stick since the antivirus program wasn't active during the change. How Do You Change the Default Languages in Google Chrome?